Kalipada Purkait started painting when he was a small child, at that time trying to express what his youthful imagination used to comprehend of his surroundings and environment. Even then, the composition in its totality was more important to him than its individual components. Today, this is reflected in his glass paintings and oils on acrylic sheets that try to capture experiences in their entirety, rather than fleeting emotions or single traits. The principal focus of Purkait's work is an exploration of the complexities of human nature, traversing its internal mechanisms and external manifestations, as well as its relationship with the everyday objects and colours that it is surrounded by. To Kalipada Purkait, light and shade and a realistic rendering of colour are of virtually no importance. His mostly figurative works, using gouache, charcoal or pen and ink, mirror everyday life, but are loud with intense and abstract colours that speak of things that are not visible or tangible, like the moods and emotion of the subjects. Lately Purkait's interests have shifted to the architectural aspects of things. The contours of buildings, bridges and other man made wonders, whether in a city or in a village, attract him, and drive him to portray not only their visual side but even their internal essence, once again using intense colour as a medium to communicate this. Kalipada Purkait's endeavour has been to give his paintings a simplified form of expression, so that they could reach out to people from everywhere, visually as well as emotionally. 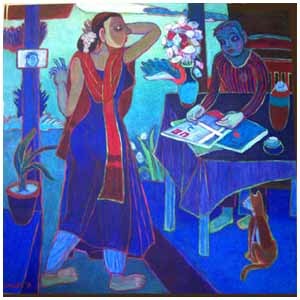 An artist and a painter by profession, Purkait was born and brought up in West Bengal, and currently lives in Kolkatta. 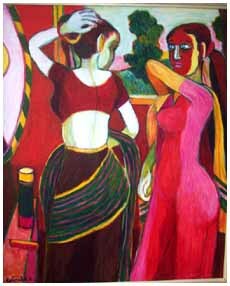 Bajaj art Gallery-Org. by Sahiil art Mumbai.2007.